My to quilt list includes several new designs for memory quilts. I have some collected materials that I have to prepare for those projects, including a pile of men’s shirts and a bag of ties. I had a few clothing items of Dad’s, some gathered from thrift shops, and some given me by a friend who thought that I could put them to good use. Time to get started preparing the materials. I always wash and dry everything before using it in a quilt. That ensures starting with clean items but also makes sure that material will stand up to washing, especially if it is going to be used in a quilt that will be used regularly and frequently washed. If it is delicate material that will be used in a wall hanging that will not have to be washed, I will wash by hand; otherwise, I wash as the quilt will be washed. I usually put the ties in large net bags but they still tend to get tangled so it usually takes a few minutes to separate them before putting them in the dryer. 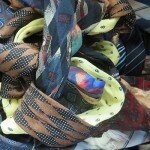 I washed everything today but am starting with the ties to prep. It is pretty easy to take them apart and takes maybe 10-15 minutes each. Of course, that adds up pretty quickly so I like to do them in batches. It is something that you can do while watching TV or listening to the radio. Take off the label with my stitch ripper. Often they can be used in another project but I only keep the ones that I find interesting and throw the rest in the scrap bin. 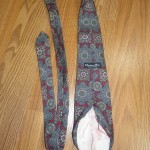 Split the seam down the back. Some open more easily than others. 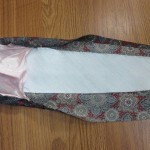 Remove the liner / interfacing. 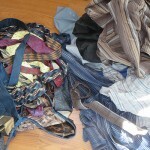 I keep linen scraps for art quilts but most of these end up in the scrap bin. 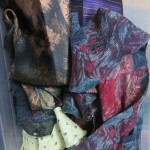 Cut out the lining material and sort most into my stash for future use. Ones that are too small or stiff go in the garbage. 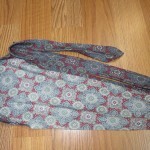 At this point, all that is left is a large flat piece of fabric that can be incorporated into any pattern. 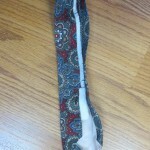 It is amazing how much fabric you get out of some of the ties – especially wider styles. I put the prepared material into a plastic container so it is ready to go in a project. I iron and attach stabilizer when I am ready to start cutting. Ready to iron, stabilize and cut. Ties are fun choices for quilts because they come in many colours and styles, and materials – including lots of beautiful silk. Because styles and tastes change, people are always buying new ones and discarding the old so it is usually easy to get a collection. Combining them in a quilt or wall hanging can be a great way to use them up – and to remember somebody who gathered them.